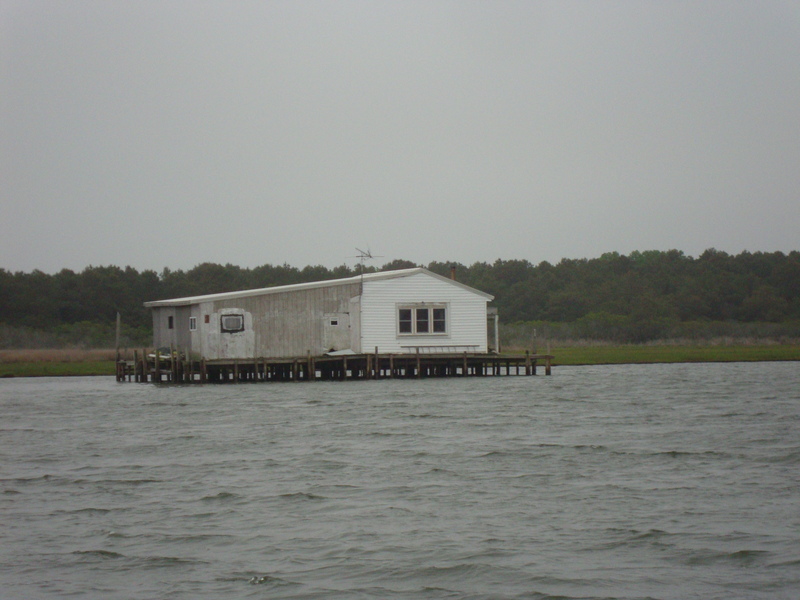 A week ago today, Skip, Chris, Shore and I were cruising across the waters off Cheriton, Virginia checking out Cherrystone Aqua Farm, a huge producer of littleneck clams who, in the last three years, has gotten heavy into growing oysters. 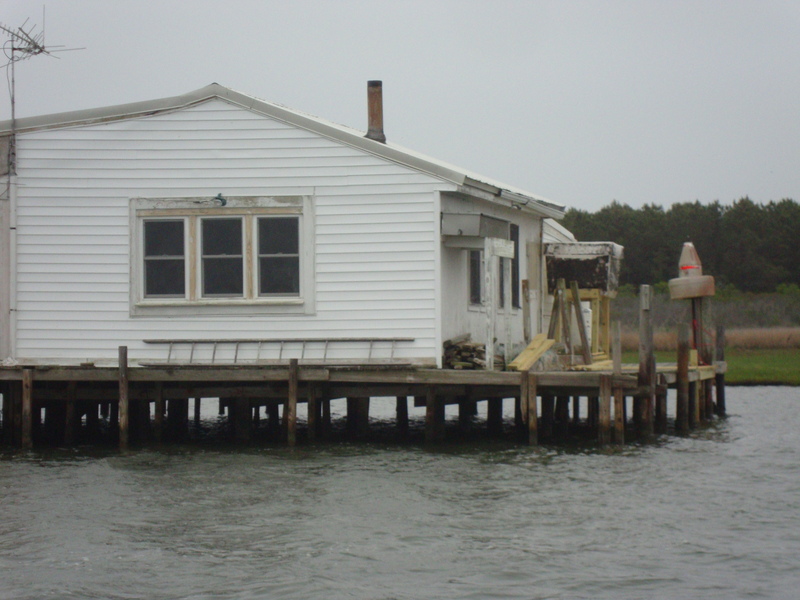 Their facilities sit on Virginia's long, spindly peninsula that separates the Chesapeake from the Atlantic. 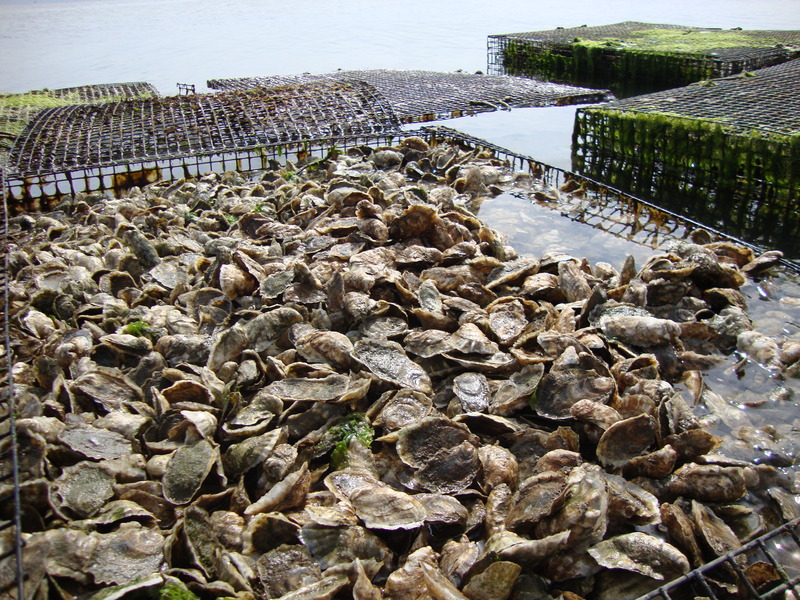 Though the company was started as an oyster business back in the 1890s, the wild supply in that area has since been decimated. So the Ballard family started farming clams. 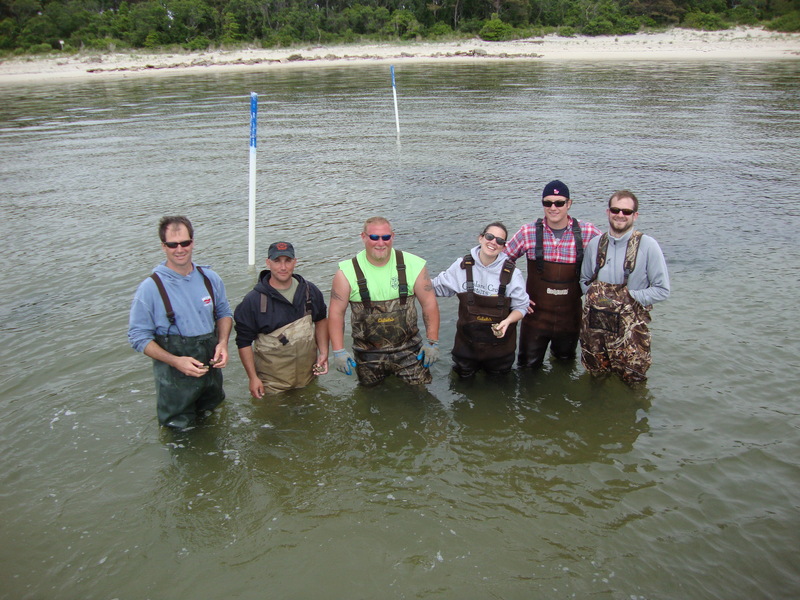 Now run by Chad Ballard III, they've become one of the country's biggest and best clam farms. 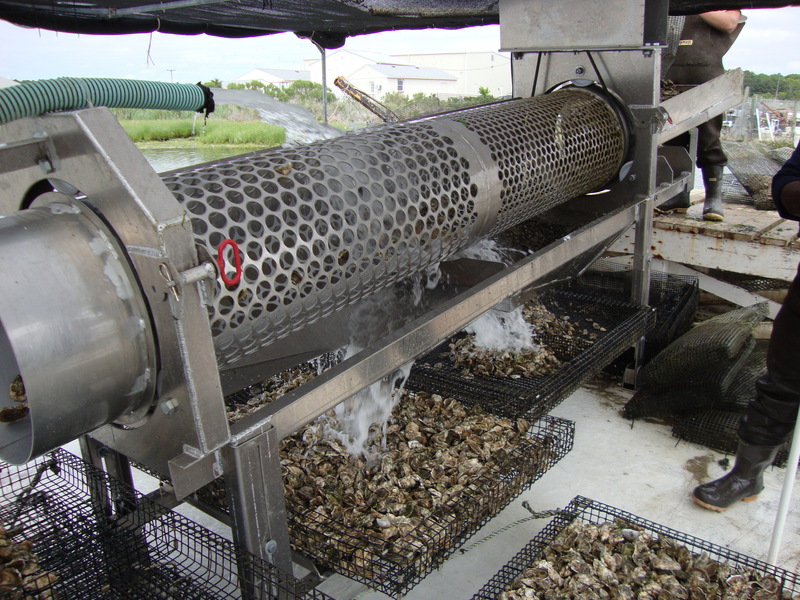 But a return to oysters was inevitable: The growing conditions are pretty near perfect for turning around 10 to 14 month old oysters at market size. They tried their hand at it a few years back and got up to speed so quickly that they'll have millions of Misty Point oysters on the market this year. 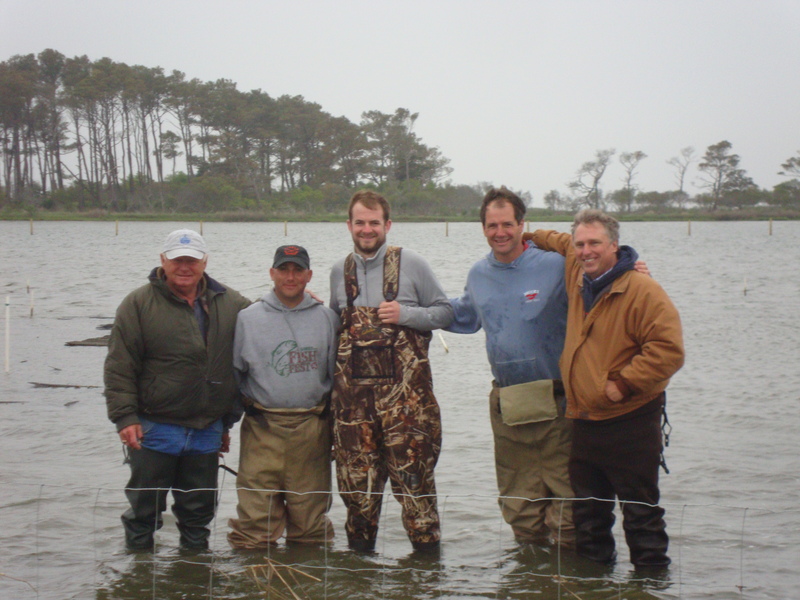 Our quick overnight trip introduced us to some of the characters that pepper the Cherrystone world, like Bubba (the Berg equivalent - though his bicep is probably rounder than Berg's head) who manages the early stages of the oyster growth on the bay side as well as Mike McGee, an oldtimer from Chincoteague Island who monitors the final oyster growout. As his colleagues told us, "The Mayor of Chincoteague" has probably owned every single business on the island at one point and now owns just about every shellfish lease there, too. 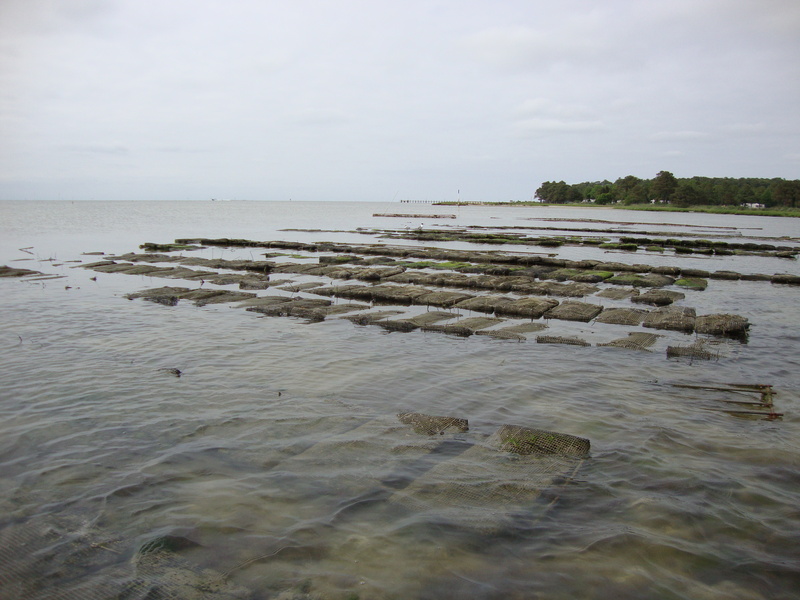 While so many things about their oyster farm reminded me of ICO (same surly, lovable crews; same lovely, waterfront landscape), there were a few really interesting differences. The first was how much space they had. The operation sits on three massive sites, miles away from each other and each has its own hatchery (hatchery!). They all sit right on the water, giving them access to a fresh supply which they use to pump over their seeds and to store their algae. 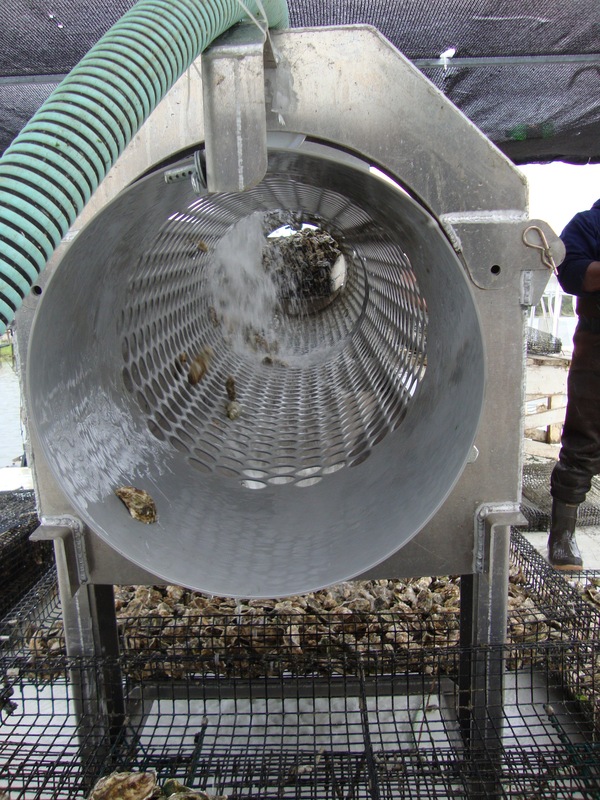 It was incredibly impressive to see that they'd dedicated one whole hatchery, on the seaside of the peninsula, to oyster seed. They also have a ton of acreage for planting. 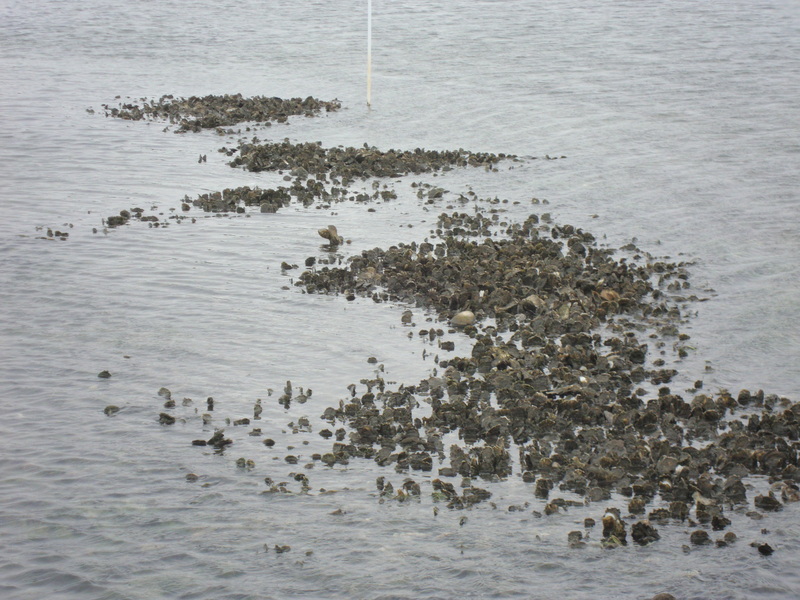 We probably only saw a fraction of the clam beds, which are everywhere, but even the oyster sites seem to be pretty generous. As we kept saying during the visit, "imagine what we could do with all that waterfront space." Oh, to dream. 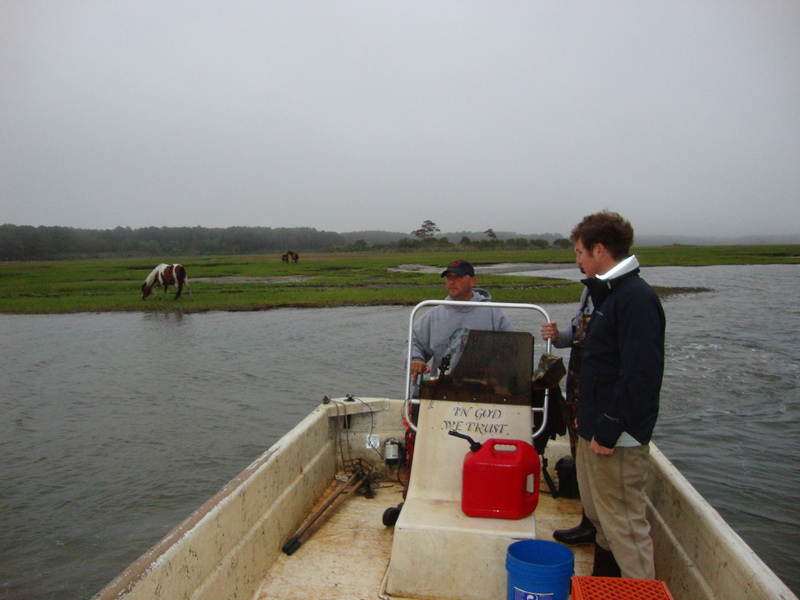 Once the oysters are ready to be "finished," they're transferred up to Chincoteague Island, famous for the wild pony population that has existed there for years. 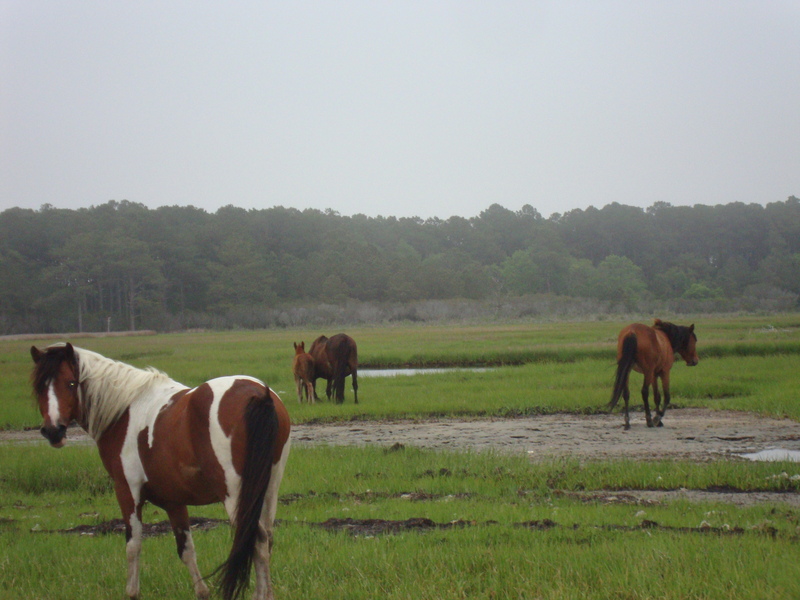 Now 200 horses strong, the herd is monitored by the Chincoteague fire department but are completely wild and feed off the salt marshes (good eats but surely their doctors would take issue). When we found them, the new baby colts were acting pretty playful -- and though they're very much wild beings, clearly, they don't mind some company. 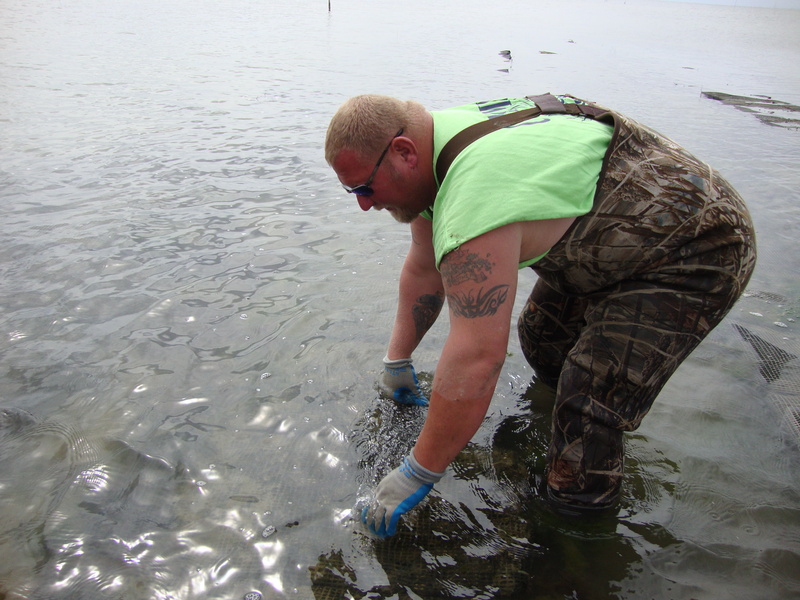 Down at the growout sites, we found more trays of oysters that were being finished and were near perfectly sized. The site was beautiful, nestled amongst flat, green marshes. 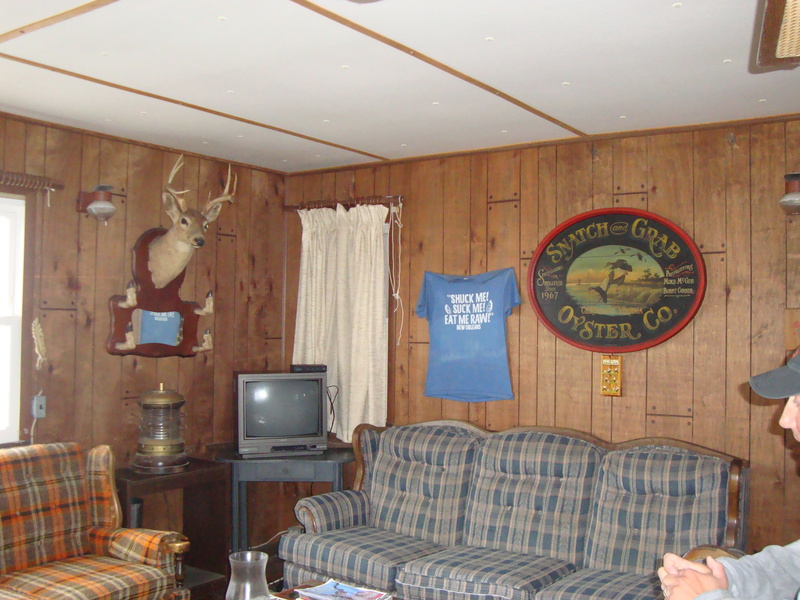 This particular site sits right beside McGee's old duck hunting cabin set above the water on stilts. After checking out the finishing oysters, Mike gave us a quick lesson on how he shucks. The guy is definitely a classic (notice the way he chips off the shell, goes in the lip, serves it on the flat side of the shell, and never loses the stogy -- a true, Mid-Atlantic method). 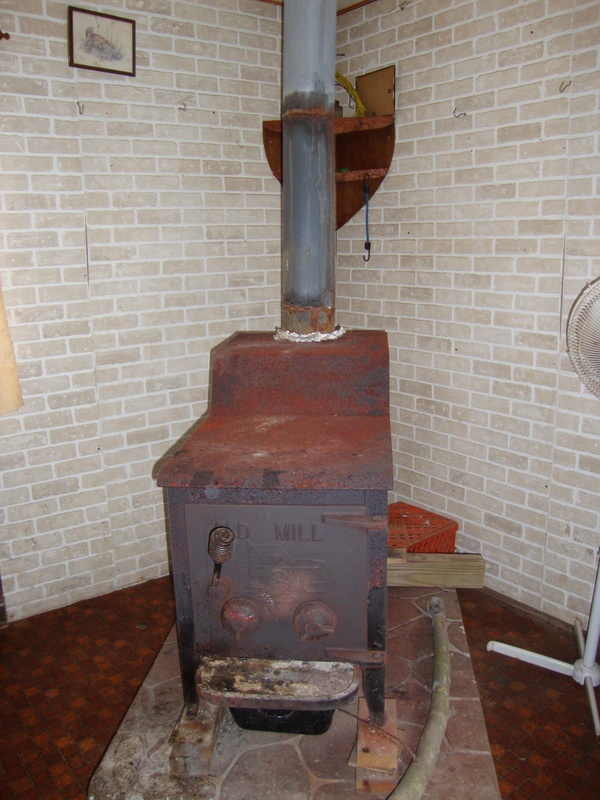 We also got a peek at his cabin (another treasure built as sturdy as Mike himself). While inside, Mike gave us the invite to come back for hunting season this fall. Don't be surprised to see another post on those adventures down the road. 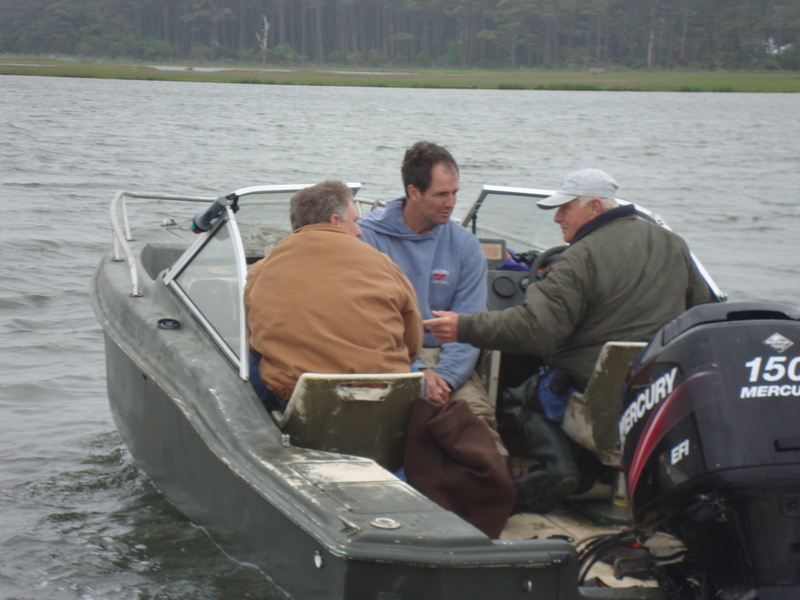 Of course, we wouldn't expect a guy like to Mike to ride around the bay on just any old boat. Nope, his is another relic, called the Grenade, and he drives it at one speed: Fast. Chris, Shore, and I, who were on the other boat, got a huge kick watching Skip, Mike and Cherrystone sales guy Tim Parsons zoom off leaving us in the wake. Skip barely got out alive but we made our way back more slowly, taking some time to stop and check out a wild oyster bed, of which there are several, set on one of Mike McGee's leases. 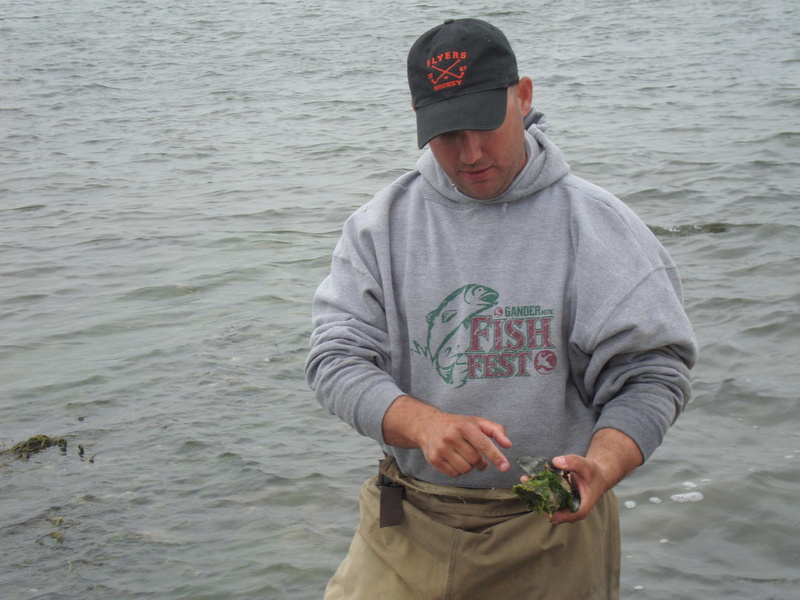 I'd never seen a wild bed before (they're a dying breed) but Mike picks oysters from them daily, getting a couple dozen bushels each time. Harvesting is tough work and requires a tiny hammer and a strong back. 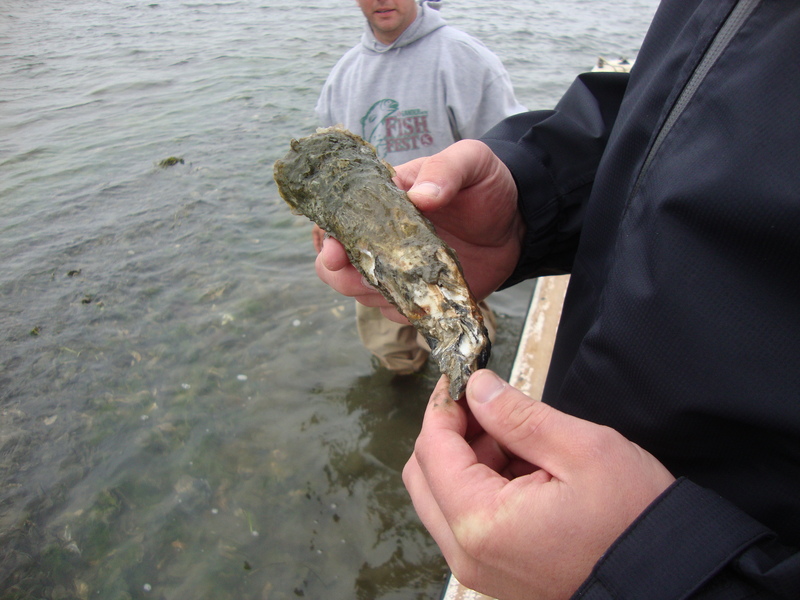 Plus, wild set oysters grow with their environment, which means they're usually misshapen and elongated, like this guy. Our tour guide and host, production manager Tim Rapine, wrapped up our trip with a stop at Sting Ray's for some barbecue. Afterward, we spent the rest of our long ride back to the airport sharing tips and ideas. Between swapping crew stories and discussing how to source a grading machine (a serious but worthwhile investment), our time with Tim was packed with information and new ideas.